SpeakOut! 2015 is taking place in the International City of Peace and Justice - The Hague, Netherlands from August 5th to August 7th. SpeakOut! is a unique three-day program of workshops which intends to bring together UNPO Members youth and young human rights activists to give them necessary means and skills to be effective in human rights lobbying and advocacy. The main target group of the event is youth aged 18-32, but older applicants will be considered. The aim of SpeakOut! 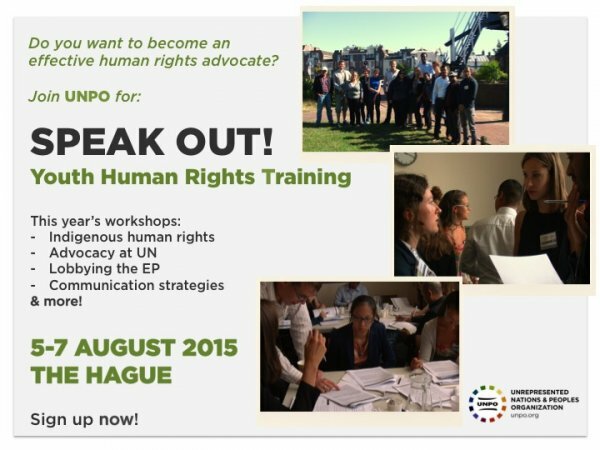 is to successfully train young activists to become reliable channels of human rights advocacy. With the support of interactive workshops and UNPO-designed study materials, participants will gain knowledge on effective Human Rights advocacy, United Nations tools and mechanisms, grassroots funding, and effective lobbying practices. Particularly, this year’s workshops will focus on Land Rights of Indigenous People and communication campaign strategies.